The 2011 Armstrong Women's Tennis Team players share their hobbies. National Weather Service meteorologists talk about support and services to the Enbridge oil spill that occurred on the Kalamazoo River in Marshall, MI this past summer. 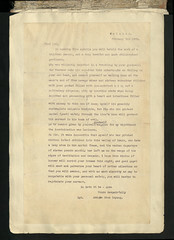 Description: Letter of complaint from dismissed official ("dejobbed person").